If you could choose between traditional heart valve replacement surgery, or one that could be done faster with a faster recovery, which would it be? You now have both options right here at home. TAVR – or Transcatheter Aortic Valve Replacement – is a groundbreaking procedure that allows doctors to replace heart valves through one small incision, avoiding the need for open-heart surgery. 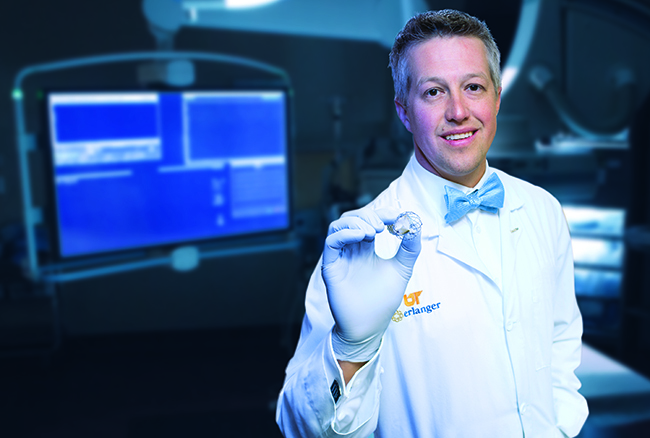 This incredible, non-invasive surgery is now available at the Erlanger Heart and Lung Institute. Recently, the Heart and Lung Institute announced the appointment of Dr. Matt Wiisanen, the region’s only fellowship-trained structural interventional cardiologist and an expert at TAVR. Dr. Wiisanen has been at the forefront of the TAVR procedure since it became available in 2012. Since that time, he has performed and assisted in hundreds of these valve replacement surgeries – more than any doctor or hospital in our region. As a structural heart specialist, Dr. Wiisanen has always been interested in providing non-invasive alternatives to open heart surgery. He was initially drawn to the TAVR procedure, because it allowed him to help more patients. During TAVR surgery, doctors insert a fully collapsible replacement valve inside the patient’s damaged valve. It opens the old valve, similar to a stent, and then takes over the valve’s operation. This TAVR replacement valve can be inserted through a simple incision in the groin or ribs using a catheter. In some cases, a second catheter with a temporary pacemaker will also be used during the procedure. Most times, the pacemaker is removed right after the surgery. As a former resident of Fargo, North Dakota, you might expect Dr. Wiisanen moved to Chattanooga to enjoy the mild temperatures. While weather was certainly a factor, it was his passion for health care that brought him here. Dr. Campbell and Dr. Wiisanen are the best Cardiologist in the South. My mom Elinor Gillilan (76 yrs old) had TAVR surgery and was able to go home next day.